We love games: board games, card games, and more! On those days when no one feels up for a formal math lesson (or the days when I need a break! ), we pull out a game and enjoy! Playing games with your little ones during homeschool time can teach a number of great skills. Here are some of our favorite educational games for homeschool. This is a list for the younger crowd. If you only have $100 to spend on games in your homeschool, here are the homeschool learning games I would suggest you buy. Busy Town: I Found It! (about $20) is a game based on our favorite characters from Cars and Trucks and Things that Go by Richard Scarry and (even more) the most recent television show, BusyTown Mysteries. I love this game because it is a teamwork game. We all win or lose together, and yet we each have our own individual playing pieces. In this game, we are all trying to get across Busytown to the ferry so we can take the ferry to picnic island and enjoy a picnic. We spin the spinner. Sometimes our car moves forward. Sometimes the pig brother eat part of our picnic. Sometimes we get a “Goldbug” card, which indicates something we need to find on the game board: balloons, bananas, traffic cones, etc. We turn the timer and start searching, all of us working together. When we find one of the items, we put our “magnifying” glass on it. When the time is up, we count how many items we found and all of us move forward that number. Our goal is to get all of us to the picnic before the pig brothers eat it all! This game teaches us to look for details. Just as we look for Goldbug on the pages of Cars and Trucks and Things that Go, we also look for the other items now. It also teaches working together. We all win or we all lose together. This is the most teamwork-oriented board game I’ve ever played, and I think it’s perfect for the preschool age group. 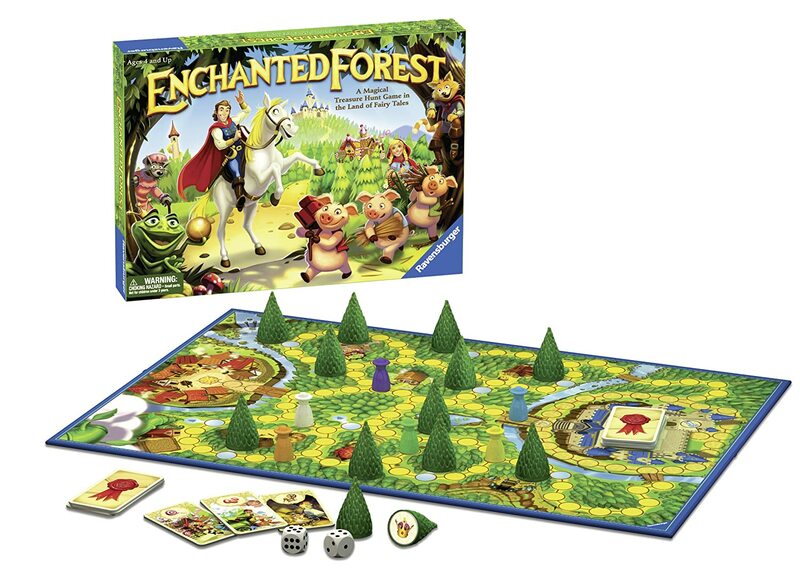 In Enchanted Forest (my personal favorite from my childhood; about $15), players travel through the forest seeking for the king’s lost magical objects from fairy tales. The king asks for a specific magical item (such as the boot from “Puss in Boots”). The players look under the trees to try to find it. When they have found the one they are looking for, they hurry to the castle. The first person to land at the castle and correctly tell the king the hiding place of the magical item wins the item. In this game, players learn to take turns, count up to 12, recognize doubles (these are “magic” and grant special powers), and remember. This is difficult for my preschooler, but it is certainly a lot of fun for my son. One of the best go-to-game for the littlest ones has to be Uno (usually about $6). Uno is fun to play, and it has the bonus of teaching color matching and number matching. There are also plenty of commercial versions with favorite characters, like Finding Dory and Frozen. (I’ll admit we have a few of those fancy versions!) Even if a child does not read numbers, playing Uno helps her begin to recognize them.We give the youngest player a break sometimes (i.e., we help her find a card to play in her hand), and she has more fun. My son was playing this all the time with me in Kindergarten! Spot It! Alphabet (about $12) helps kids practice recognizing letters. It can be either a quick paced game or a more independent one. My daughter gets frustrated when big brother plays because he is so fast! But, slowly and surely she is improving. It is certainly a fun game, and she loves when she spots letters that match. This is a great game to incorporate into homeschool because of its obvious learning benefits..
Clue Jr (about $25) is a process of elimination game. The players travel around the house, looking under people and furniture to discover who ate the cake. Kids can mark on their tracking sheet which items they have already seen. When they have all marked but one item in each category (a drink, the furniture, and a person), they can make a guess as to who ate the cake! Players learn to count, plan ahead, take turns, and of course work with logic to determine which item has not been seen. The process of elimination is difficult for my preschooler, but regardless, it is always fun to check for the cake crumbs! Skip Bo (usually about $6) is a number game as well, this time practicing putting numbers in order while trying to lower a stack of cards. Players have a stack of 20 or 30 cards (depending on how long of a game you want to play). They only flip over the top card. Then, using a hand of five cards each turn, they make piles in the middle of the game table beginning with 1 all the way to 12. The goal is to play the cards from the stack, but the cards in your hands help you get there! Although my preschooler cannot take this game for long, she can get through a few rounds of 1 to 12 before she bows out of the game. Scrabble tiles (from $6-$15). I guess I could add the game Scrabble to this list, and yes, Scrabble is a great game for older kids. But just getting the letter tiles give you a versatile tool for practicing letter formation in your homeschool, especially for the youngest ones. Do your spelling list with tiles, match already spelled words on a template, or otherwise have fun matching and playing with the letter tiles. Sometimes, the game board is really unnecessary for homeschooling time. I feel like I’ve barely touched the surface of what games you can get for your homeschool and what they teach you. I only got through my list for the younger ones this time, yet this list has reach $100. Next time, I’ll share some great games for older kids too! I feel like it is incredibly important to play games as a part of our homeschooling day. It keeps our relationship more than simply lecture and nagging (yes, I find myself doing that some days!). There is a lot to be learned from a well designed game! Besides, because my son loves them so much, he is often making up his own games. I love that his love for games has expanded into creation in that way! I’m happy to support that. 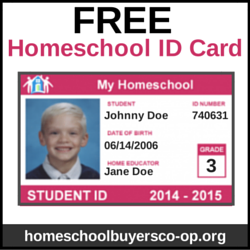 See what else my fellow bloggers would get if they had $100 to add to their homeschool (or, if they can homeschool with only $100).